Congratulations to the domestic workers and their employers who have shown us that there are indeed many employers that respect and appreciate their domestic workers! 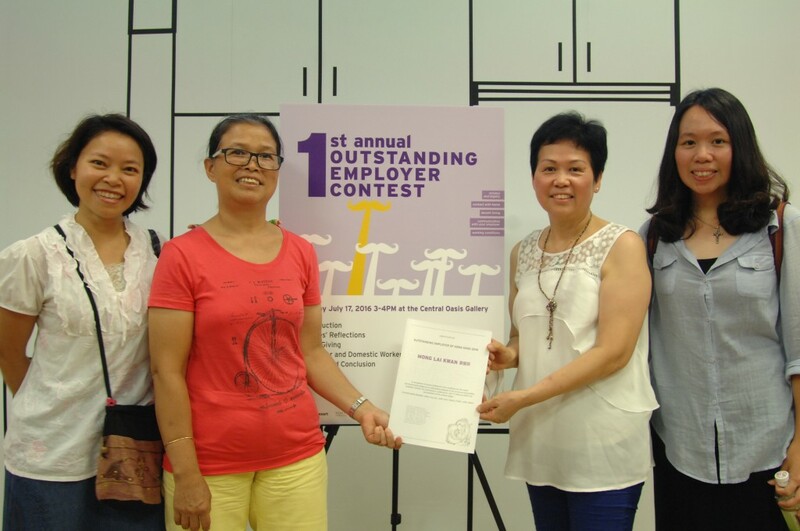 On Sunday, July 17, 2016, the prizes and Certificates for the Outstanding Employers of were given out, at the 1st Annual Outstanding Employer Contest Prize Giving Ceremony. Ms. Chung Yin Kwan（鍾燕群）and her domestic worker Iswati, from Indonesia. And Ms. Lau Miu Yuen（劉妙婉）and her domestic worker Lory Jean T. Yungco. Their domestic workers gave so many examples of their employer’s’ consideration and respect for them. “She’s not only a housekeeper to me, but a true friend of mine!” Ms Mong said. She recalled once she went to visit Riem in her electrotherapy ward, while she herself was pregnant; a worried Riem kindly asked Ms Mong to stay away to avoid the radiation. Iswati never felt like she was treated as a domestic helper but instead part of the family living together cooperatively. Ms Chung wasn’t obligated to see to her personal matters but she did – both her dream and goals, and her family’s urgent needs. She fully financed Iswati’s studies in Hong Kong and footed the bill for her sick relative in the hospital. Ms Chung expressed her own gratitude as well, for all the ways Iswati had helped her in her home. She spoke briefly but the grateful expression in her eyes was very apparent. 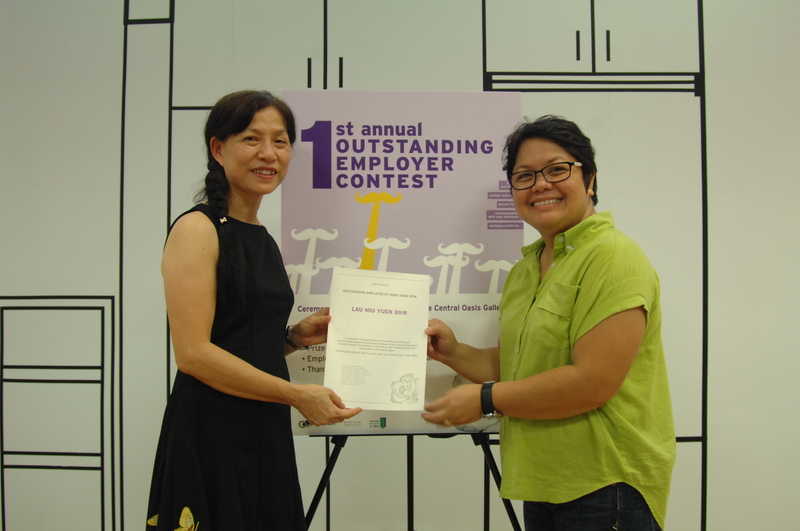 Lory has been working for her employer Ms. Lau for 20 years. One of her employer’s children who she had raised since his birth, was also present to take their pictures. Lory said, “All I can say is that she’s the best employer! And she’s the only employer I’ve ever had in Hong Kong.” She also said she thought this Contest was a great opportunity to tell people that having a house worker is a privilege, and that domestic workers need to be treated like everyone else – like human beings. According to what Ms Lau, Lory was not the first worker she had hired but she could easily be the best she had ever seen. They had been together through thick and thin in the past 20 years, including her son’s coming of age, Ms Lau’s mother’s departure and Lory’s father’s departure. The experience and memories they created together has made tw persons who had never met before each other’s emotional support.